‘The Ben Daniels Memorial Fund and Cardiac Risk in the Young (CRY) is delighted to sponsor Calum Haggett’s playing shirts. The Ben Daniels Memorial Fund works with CRY to provide cardiac screening for young people within Ben Daniels sporting community. Sadly 12 people a week in the UK collapse and die from heart problems they did not know they had. Ben Daniels was one of those 12. He played his cricket at the Old Elthamians CC. The Fund provides screening to young cricketers in Bromley, players within the North Kent Junior League and the Kent Development squads. Calum’s own personal journey into professional cricket is testament to the importance of being screened and we are delighted that he has kindly agreed that Ben’s Fund and CRY sponsor his shirts. His rise in the game is made even more impressive by the fact that a routine screening session in 2010 showed he had a heart condition which required open-heart surgery. An all-rounder, Calum extended his contract with the county in the winter after enjoying an impressive first season at the Spitfire Ground, St Lawrence. The former England Under-19 star joined Kent from Somerset after a successful trial period and soon developed into an important first-team player. On his Championship debut against Leicestershire, Calum scored 40 and claimed three wickets to highlight his talent. He went on to become a regular in all forms of the game taking thirty wickets in total, with his lively medium-pace, and in the four-day game he averaged a healthy 41.50 with the bat in his first season. Injury issues restricted Haggett’s involvement in 2014, he bounced back in 2015 with career-best figures with bat and ball. 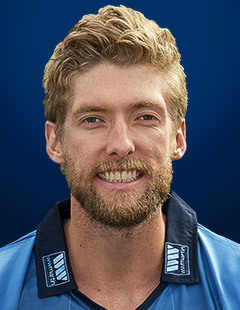 His 80 at Surrey and 4-43 against Essex on a good Tunbridge Wells pitch showed supporters a glimpse of his promise as he became a regular in Kent’s County Championship fixtures and NatWest T20 Blast squads.